Okay, let’s continue. In the last post, we introduced a funny thing from PGM XIII, the Eighth and Tenth Hidden Books of Moses that I’ve brought up before on this blog now and again. This thing is the notion of Rulers of the Pole, a type of planetary rulership of a given day that doesn’t follow the normal weekday rulership we’re accustomed to. There’s not a lot in PGM XIII that describes their use, but similar language is present throughout the PGM when we talk about things involving the Bear-related spells, i.e. the rituals and incantations associated with the northern constellations of Ursa Maior and Ursa Minor, which generally have lunar or Artemisian-type qualities. “Hail, of guardiants of the Pivot, o sacred and brave youths, who turn at one command the revolving axis of the Vault of Heaven, who send out thunder and lightning and jolts of earthquakes and thunderbolts against the nations of impious people, but to me, who am pious and god-fearing, you send health and soundness of body and acuteness of hearing and seeing, and calmness in the present good hours of this day, o my lords and powerfully ruling gods! Hail to you, the first, ΑΙΕΡΩΝΘΙ! Hail to you, the second, ΜΕΡΧΕΙΜΕΡΟΣ! Hail to you, the third, ΑΧΡΙΧΙΟΥΡ! Hail to you, the fourth, ΜΕΣΑΡΓΙΛΤΩ! Hail to you, the fifth, ΧΙΧΡΩΑΛΙΘΩ! Hail to you, the sixth, ΕΡΜΙΧΘΑΘΩΨ! Now when they take their place, here and there, in order, look in the air and you will see lightning bolts going down, and lights flashing, and the Earth shaking, and a god descending, a god immensely great, having a bright appearance, youthful, golden-haired, with a white tunic and a golden crown and trousers, and holding in his right hand a golden shoulder of a young bull: this is the Bear which moves and turns heaven around, moving upward and downward in accordance with the hour. Then you will see lightning bolts leaping from his eyes and stars from his body. Das wahrscheinlichste ist mir, daß bei Einführung der sieben Jünglinge mit Stierköpfen die Repräsentanten der sieben Sterne des großen oder des kleinen Bären mitgewirkt haben; denn die Ägypter dachten sich jedenfalls den großen Bären als Stier oder als Teil eines Stieres. Darüber habe ich gleich weiter zu handeln; wenn Mithras selbst, wie wir sehen werden, mit seiner Hand die Stierschulter, d. i. das Bärengestirn lenkt, so ist es sicher, daß die sieben stierköpfigen Gestalten, die die Achse des Himmels drehen, die sieben Sterne des kleinen Bären sind. Wie es zusammenhängt, daß für unsere Kenntnis gerade der große Bär als Stier oder Stierschenkel oder Schulterblatt eines Stieres gedacht war, kann ich nicht mehr erkennen… Sicher ist auf jeden Fall, daß die Πολοκράτορες die sieben Sterne des kleinen Bären sind. The most probable thing is that when the seven youngsters with bull heads are introduced, the representatives of the seven stars of Ursa Maior or Ursa Minor are involved; because the Egyptians thought in any case Ursa Maior as a bull or as part of a bull. I have to act on it immediately; if Mithras himself, as we shall see, with his hand the bull’s shoulder, i.e. 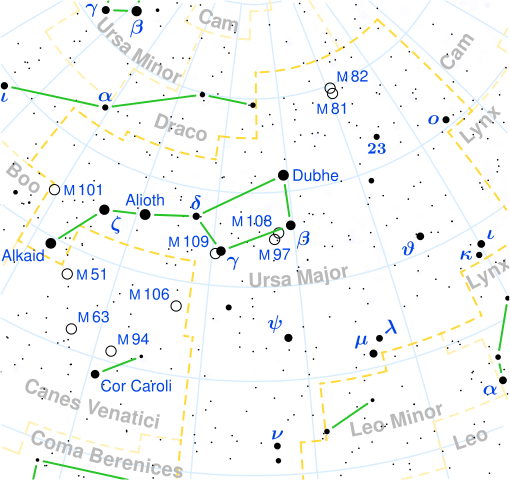 the Bear Star steers, so it is certain that the seven bull-headed figures, which turn the axis of the sky, are the seven stars of Ursa Minor. 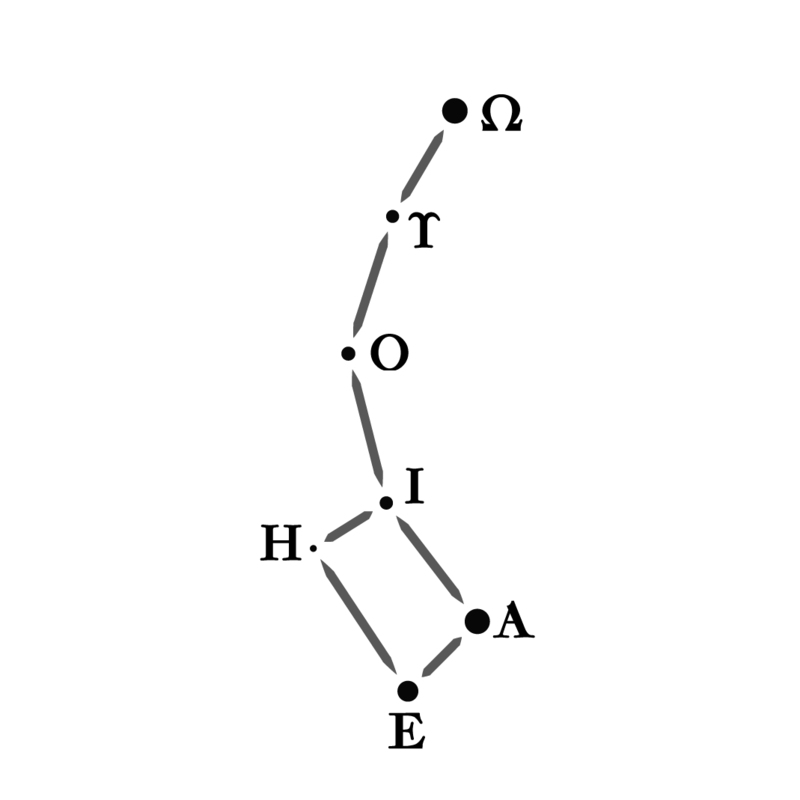 As it is related, that for our knowledge just Ursa Maior was intended as a bull, thigh of a bull, or shoulder blade of a bull, I can no longer recognize… In any case, it is certain that the Polokratores are the seven stars of Ursa minor. These can be seen and guessed at by the floor mosaic of the Mithraeum of Felicissimus in Ostia, where each grade is symbolically described through its attributes on the way to the focal devotional point of the temple: the Raven with the caduceus of Mercury, the Bridegroom with the circlet of Venus, the Soldier with the weapons of Mars, the Lion with the wreath and sistrum of the King and Queen of the Gods, the Persian with the Crescent and crescent sickle of the Moon, the Sun-runner with the torch and sun-crown and chariot-whip, and the Father with the shepherd’s staff, robes, and other implements of the leader of the cult. It’s certainly compelling. However, despite this floorplan of a sacred initiate-only space, it’s unclear whether the order given above really is the order to be considered official, especially given its apparent strangeness; there’s no way to draw a heptagram, for instance between these planets in this order that can get us anything we’ve seen before unless we were to swap a few things around. That feels like bending things way too much for my comfort level, so let’s just set this initiation order aside. What’s important is that we have a definite connection between the seven planets and the seven stars of Ursa Minor, each of which can be seen to be representative of one of the planets in an elevated state, each of which rules over the axial pole of rotation of the Earth itself from day to day. Betz refers to the scholar Roger Beck on a particular zodiacal depiction at the Mithraeum at Ponza (first paper here, second paper here) which also give interesting insight on the role of Ursa Minor (and Ursa Maior) and the pole stars generally. To summarize Beck’s findings and theories, it really does seem like the depiction of the stars of Ursa Minor really are about an “upwards and inwards” motion of theurgy, as “we pass from the planetary world of the zodiac to the realm of the Sun…and finally to the supreme god at the polar centre”, and that “in both it is a journey of refinement to orders of a higher spirituality”. If we were looking for a reason to work with the Ruler of the Pole, this is a strong confirmation that our hunch earlier about the parallel with the Earlier Heaven/Later Heaven Sequence of the Ba Gua was on the right track. At this point, it’s tempting to make that one final leap: linking the seven stars of Ursa Minor to the seven planets, giving the Pole Lords of PGM XIII the names of the seven bull-headed youths from PGM IV. We’re so close, but we’re missing a definite connection of which youth (and name) is supposed to go with which planet. Do we use Clauss’ hypothetical ranking of grades, from Mercury to Saturn? Or do we use the heavenly order of the planets from the lowest heaven of the Moon to the highest heaven of Saturn? Personally, I’m inclined to use the heavenly order, such that the name of the Moon when she is the Pole Lord is the name of the first bull-headed youth AIERŌNTHI, the name of Mercury as Pole Lord is MERKHEIMEROS, and so forth, but…something about this seems hollow, and I don’t get a confirmation gut-feeling like I normally (recklessly, haphazardly) do. I’m not willing to bet on it, though I love the simplicity and convenience; something seems missing, even if it’s just confirmation. Personally, I’m most inclined to think that Polaris itself is given to the quality of Saturn; note how Saturn is the ultimate grade in the Mithraic Mysteries given above, and Saturn is also the only planet that rules both the pole and the day on the same given weekday, as well as it being the highest and most distant of the planetary heavens. 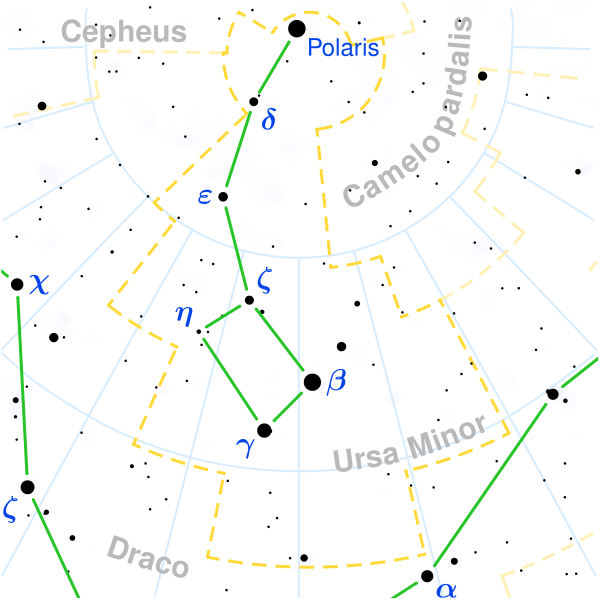 Giving Polaris the final position of honor, I would be comfortable giving it the name of the seventh bull-faced youth, EORASIKHĒ. That just leaves the remaining six. It doesn’t seem like we can use traditional stare-lore here; there’s not much in the way about the planetary natures of this set of fixed stars, and many such fixed stars share in multiple planetary similarities. It’s good to know that Ptolemy gives bright stars to Saturn with a hint of Venus mixed in (especially for Polaris), but that’s about it. I’m reminded that Kochab and Pherkad are considered even by ancient Egyptians as “guardians of the pole star”, which makes sense as they’re the next two brightest stars in the constellation of Ursa Minor, but they also stand furthest away on the “dipper” part of the Little Dipper while Polaris stands at the tip of the handle. I’m tempted to give these to the Sun and the Moon, respectively, as representative of their corresponding brightness in the planets; this would also mean that the corresponding planetary Greek vowels for the three brightest stars would be the same three vowels in that almighty name of divinity, ΙΑΩ. That would mean Kochab gets the Sun, and Pherkad gets the Moon. These two planets given to these two stars with Polaris given to Saturn collectively set up a pattern where we use the distance-along-the-constellation-lines method along with the weekday ordering of the planets, which gets us the following order and correspondence of names, such that Kochab gets the Sun, Pherkad the Moon, Alasco Mars, and so forth. “Hail, o seven Fates of Heaven, o noble and good virgins, o sacred ones and companions of ΜΙΝΙΜΙΡΡΟΦΟΡ, o most holy Guardians of the four pillars! Hail to you, the first, ΧΡΕΨΕΝΘΑΗΣ! Hail to you, the second, ΜΕΝΕΣΧΕΗΣ! Hail to you, the third, ΜΕΗΡΑΝ! Hail to you, the fourth, ΑΡΑΜΑΧΗΣ! Hail to you, the fifth, ΕΧΟΜΜΙΗ! Hail to you, the sixth, ΤΙΧΝΟΝΔΑΗΣ! With this, we have seven snake-headed women and seven bull-headed men. The men represent the stars of Ursa Minor, and the women represent the stars of Ursa Maior. We can use the same system, starting at the end of the cup of the Dipper and headed towards the tip of the handle, to associate planets and names to the stars of Ursa Maior. Further, because we’d want to use the same system for both the stars of Ursa Maior and of Ursa Maior, that means we’d scrap our weekday order of the planets as discussed above and use the heavenly arrangement of the stars, starting with Kochab as the Moon and Pherkad as Mercury to end with Polaris as Saturn. This has the nice, pleasing benefit of being that oh-so-special Seven-Zoned arrangement PGM XIII loves so much, but also has a nice geometric arrangement: the closer you get to the pole along the constellated “path” of Ursa Minor from star to star, the higher the heaven you access according to its corresponding planet. I guess the association of the seven bull-faced youths in order to the seven planets according to the heavenly arrangement would work out well enough in the end, but it was good to actually use the map of the stars of Ursa Minor themselves to make a stronger argument for why that should be so. I still like the idea of Kochab and Pherkad going to the Sun and the Moon, but on the whole, this system works nicer and cleaner, especially with the connections to the seven snake-faced virgins. Plus, with the second brightest star being given to the Moon in this scheme, this gives a pleasant balance and return to how important the Moon is when talking about the northern, artic, Bear stars: the Moon represents the initial approach towards sensible divinity, and Saturn the final escape to intelligible Divinity. This is making huge progress, but we’re not done yet. Stay tuned, and we’ll talk more about how we might understand the nature, form, and function of these entities, especially when we pair it back to certain things back in PGM XIII.